Historical High for India ! Phalodi, Rajasthan, India, records India's highest ever temperature when it recorded 51.0c on 19th May 2016. Hottest in Gujarat: Ahmedabad (Highest ever) and Deesa at 48.0c. Hottest in Maharashtra: Jalgaon 46.6c. Pakistan Met Department announces 52.2c in Larkana on 19th May 2016..
BB-1 is positioned at 16N and 83E, around 240 kms South West of Vizag, has turned track to East/North East. It is now tracking along the North West periphery of the STR. Will track North East. The only signs of it being a cyclone (Roanu) is the Core pressure estimated at 985 mb and core winds estimated at 50 knts. 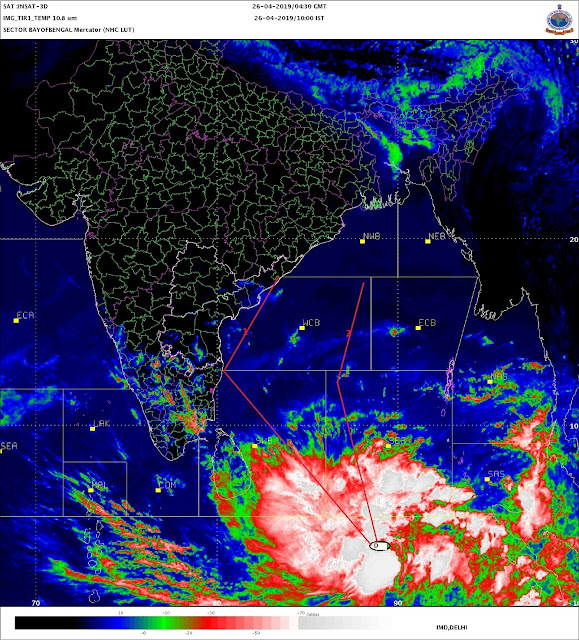 With a decreased deep convection around the centre, nor any specific convective band seen, and with a persistent vertical shear, it does not resemble a cyclone in the satellite image. "Roanu" will keep its strength, or still deepen a bit, before weakening from Saturday. Sir any developments in Arabian sea next few days to trigger some rains around West coast maharashtra especially North konkan area like mumbai raigad. Easterly wind makes delhi humid with high heat.Due point around 25℃. Super rain in bangalore last two days. My place in extreme south recorded 38 and 44mm. S0 82 mm in 2 days. Overall my place is at 137mm for the year. IMD BANGALORE AT 158 MM.